After 20 many years working as a Private Investigator there comes the time you need to face retirement. I was Feeling,unproductive,useless and depressed not knowing what to do with my spare time... I began to see where I can put my talents to use,that's when I began getting interested in the Paranormal,close encounters and Bigfoot it seemed interesting and it was just right up my alley... it was something for me to do and possibly find the answer to the questions so many people have been asking. I began researching the internet and take courses on line and attend meetings with other investigators..now after a couple of years and fully certified I'm now out in search of the answer is there life after death,s the life on other planets and most of all does big foot really exist! Ghost hunting is the process of investigating locations that are reported to be haunted by ghosts. Typically, a ghost hunting team will attempt to collect evidence claimed to be supportive of paranormal activity. Ghost hunters often utilize a variety of electronic equipment, such as the following types: the EMF meter; digital thermometer; handheld and static digital video cameras, such as thermographic (or infrared) and night vision; digital audio recorder; and computer. Traditional techniques such as conducting interviews and researching the history of a site are also employed. 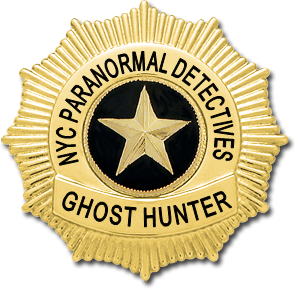 Some ghost hunters refer to themselves as a paranormal investigator. While many groups utilize "scientific methods" in their search for the ghosts, no scientific body has been able to confirm the existence of ghosts. Ghost hunting can be classified as a pseudoscience. If you'd like to join my group I would really love having you. Ghost Investigations- going to a known haunted place and recording data (video, photos, audio, temperatures), notes, interviews and other evidence to prove/disprove the haunting and to assist the owners and the spirits in moving on and leaving the place if they want that. The assistance can be either you directly assisting the owner with the situation or putting them in contact with experienced groups or individuals that will try to resolve the situation. Your assistance can be something as simple as educating them on what is going on and their options. The best times are from 9pm to 6am, these are the psychic hours, but anytime can produce results. Photos have historically been better in the dark but don't let that discourage you from taking them during the day. Find out all you can about the history of the locale. Newspapers, town historians, WWW and books can be helpful finding folklore or hard facts about the site. The books and web pages dealing with this type of info is enormous. We have a haunted places listing here with over 1000 places listed. * Digital Camera - Regardless of what you've heard digital cameras are great tools for ghost researchers. Once upon a time they had their limitations and problems but that is no longer the case. Now you are also get cameras that are modified to see in the Infrared spectrum of light or Full Spectrum cameras that can see in the Ultraviolet, Visible and Infrared spectrum of light at the same time. * Digital Voice Recorder - digital voice recorders are with out a doubt one of the most important pieces of equipment that you should have in you investigators toolbox. audio recorders are used for many different purposes throughout an investigation. Recorders are used for interviews, spontaneous thoughts, your notes and electronic voice phenomena (EVP). When using audio recorders be sure to state the location, time of investigation, and investigators names. When recording investigators names it would be wise to have each individual present state their own names, which will make it easier for distinction amongst voices heard on the tape during review. Voice activation mode should be deactivated on tape recorders during use when electronic voice phenomena is trying to be achieved due to the fact that it usually cuts off beginnings of words, sentences, and phrases. * Flashlight w/ spare batteries - a common sense item. Remember to bring spare batteries for everything. Due to spirit activity, batteries often run down very fast and you don't want to miss anything because of dead batteries. I recommend using a red light flashlight to help preserve your night vision. * Notebook w/ pens and pencils- you need to write and log in everything that happens. If you don't then you really don't have much research information. An example of this is one investigator gets a EMF reading that's high and never writes it down. Another investigator takes a picture of the same area but is not aware of the reading and gets a anomalous image. Without that EMF reading the picture may be good evidence, but with a report noting the reading, the picture greatly increases in evidence value. Many investigators use a pocket tape recorder in stead and that is fine, just make sure you have spare batteries and tapes. * Thermometers - Thermometers are an instrument that is also very useful There are two types used regular digital thermometers and infrared non contact thermometers. When used on an investigation this will aid as a detection system for spirit presence. Rapid temperature drop of 10 degrees of more could indicate spirit presence. I recommend using the infrared non contact thermometers but cause they react in less than a second to a temperature drop and you can scan a large area quickly. * Hand Held Radios - Or Walkies Talkies are very useful in a large outdoor area and a building with groups spread out in various rooms. They could be great in emergency situations or just to rotate groups. Be sure to be aware they could interfere with your EVP recording though. 2. Enter the site and either privately or as a group ask for blessing or protection for the duration of the hunt. You can use this time to put yourself in a positive frame of mind. It does not have to be a religious thing so everyone can do this in some way. I do encourage everyone to take the 10 seconds this takes and do this. What can it hurt? It's better to be safe than sorry. Many experienced groups believe that there are evil spirits in many areas such as cemeteries and by saying a 10 second prayer or making sure you are in a positive frame of mind you can safely go about your business without worrying about them. An experienced demonology will tell you that by doing this in the name of God or whatever good deity you worship, you will keep any non human spirits at bay since they have to leave you alone when told so in this manner. The prayers I use are found here. * Make sure you view or listen to the whole recording. EVPs are usually not heard at the time of recording but are heard only after the tape is reviewed. This form is just something for you to build on. It based on the form my group uses for outdoor investigations. Feel free to download and use it. I have a preview page of it and you can download it there. Add to it , change it to suit your needs, it's just a starting point. These are some places you can start your ghost hunting at. These are suggestions and you should not limit yourself to just these, spirits can be anywhere. Don't let the age of a building or area fool you. The house I lived in for 29 years which had ghostly activity in for 26 years is only 70 years old but it is built on land that was settled and lived on in 1685. Also, remember, do not trespass. * Theaters - The actors have run the gambit of human emotions inside the walls of a theater plus many have interesting haunting s attached to them. * Churches - There is a long history of the faithful returning to the church they worshiped at. They may be looking for the salvation they were promised and cannot find. * Historic Locations - Many historic buildings, because of their age, have had more time to have spirits attach to it. These buildings are often open the public and can give you a easy place to start. Many even have known histories of haunting s and you may be able to gain access to the building after hours after speaking with the caretakers. * If it is is raining, snowing or foggy and you are scheduled to do an out door ghost hunt, reschedule it. You cannot conduct a proper investigation in these conditions. As with most of the page in the Shadow lands, this one will rely on others to help it grow. So if you have a tip, procedure or suggestion to add let me know. I am counting on the more experienced investigators out there to assist us here so we can all share the info and further this field of study in a professional and respectable manner.